The questionnaire which you will find below is an initiative of the State-General of Energy Efficiency, the public consultation now in its third edition, organized by ENEA (the Italian National Agency for New Technologies, Energy and Sustainable Economic Development) in collaboration with EfficiencyKNow. The aim of the initiative is to make available to all a web-based consultation platform to support the achievement targets identified by Directive 2012/27/ EU. The initiative is chaired by Alessandro Ortis (former Chairman of Italian Regulatory Authority for Electricity Gas and Water). The theme of the 2016 consultation is behavioral change. Each of us, through a more rational use of energy, can help reduce consumption. We would be grateful if you could give us a little bit of your time to complete the questionnaire and offer us any of your suggestions on how to spend less energy within the University context. Filling out the questionnaire will take only 15 minutes but it will serve us in collecting ideas, views and useful information. The questionnaire is anonymous and will be online until April 15 2017. Thank you for your precious collaboration! The field is optional, but if you provide us your email we will be able to keep you updated on the developments of the consultation! “Energy efficiency” means the capacity to be able to “do more with less”, adopting the best technologies/techniques available on the market and a conscious and responsible behavior towards energy uses. Means to harness the energy in a rational way, eliminating waste and losses due to the operation and a suboptimal management of simple systems (engines, boilers, household electrical appliances) and complex systems (the buildings in which we live or work, industries, transport ). Basically, the most efficient use concerns and involves the entire country. 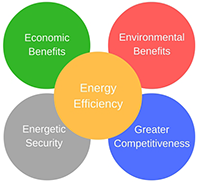 Energy efficiency is achieved by implementing various forms of interventions, including technological improvements, optimization of energy management, behavioral changes for a more rational use of energy and diversification of its supply sources. Waste and energy losses represent the “hidden fuel” we have and energy efficiency allows us to restore and optimize to obtain substantial economic benefits both socially and environmentally. For these reasons, energy efficiency is an essential component of European energy strategy, aimed at achieving a lower, safer, more competitive, more sustainable use of energy. Thank you for your contribution. Share the questionnaire. © 2016 – en. All Rights Reserved. #SGEE17 A project by ENEA.